Many sailing schools and junior programs instruct beginners in small (10- to 14-foot, or 3- to 4-meter, long) one-person boats; others use larger two- or three-person dinghies, as Figure 2-1 shows. Ideally the boat has a relatively stable hull shape (not too tippy) and a conservative amount of sail area. No need to break any speed records on your first sail! 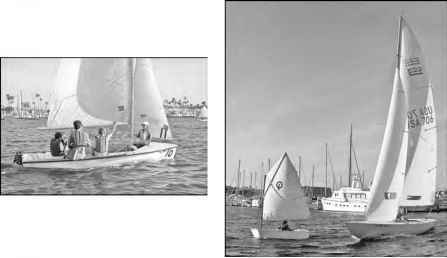 At left, kids on a 420 trainer dinghy; at right, a single-handed Optimist dinghy next to an E-22 keelboat. i They're responsive. Due to the boat's light weight, changes in helm, weight position, and sail trim give instantaneous feedback. You can really feel the boat sail. i The helmsman trims a sail. On most dinghies (especially the singleperson variety), the helmsman must do more than just steer, providing you with a more complete understanding of how everything works. 1 They're inexpensive. Therefore, they're favored by many programs that have limited budgets. 1 Their smaller size makes them less intimidating. Would you rather take your driver's education class in a compact car or a minivan? 1 They can capsize. You can argue that the possibility of capsizing is a "pro," especially because we think that everyone who sails a dinghy needs to know how to right a capsized boat. (We cover that subject in Chapter 7.) 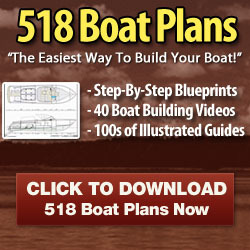 Finding out how to right a flipped boat, however, isn't a priority if you start on a keelboat. 1 They're wet. Typically, you sit lower to the water in a dinghy than on a keelboat, and being wet can be uncomfortable. But, hey, if water hurt, sailors wouldn't go sailing (at least not as often). Check out Chapter 3 for some clothing ideas to stay more comfortable in the inevitable dampness of sailing. 1 The instructor doesn't ride with you. Having the instructor with you is an option, but some small dinghies get pretty cramped with two people on board. Often, the instructor follows you in a motorboat, shouting advice as needed.